PATHEIN, Irrawaddy Region — The Forestry Police arrested an elephant poaching ring in Irrawaddy Region’s Ngapudaw Township on March 9. Acting on a tip, combined forces from the Forestry Police, Nga Yoke Kaung sub-township police department, the Forestry Department, village administrators and Elephant Emergency Response Units (EERU) cornered the ring in Myittayar Forest Reserve in Ngapudaw Township. Two poachers were arrested and one escaped, local village tract administrator U Kyaw Myint Tun told The Irrawaddy. “We arrested two hunters with poaching equipment. Another poacher got away, but we are going after him. We are undertaking plans to prevent elephant poaching in our region,” he said. The two hunters who were arrested are respectively from Rakhine State’s Taungup Township and Ngapudaw Township. The third poacher from Magwe Region is still at large. 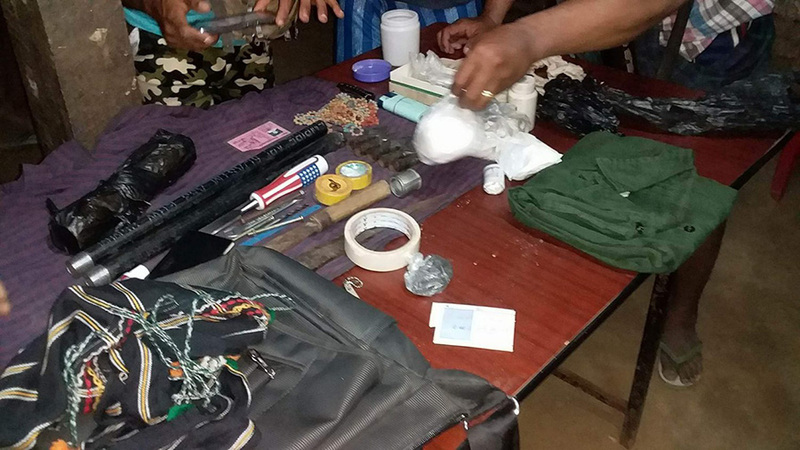 Percussion firearms, metal bolts, iron rods, arrows, gunpowder and more were seized from the poachers, according to the Forestry Police. “It is important to arrest poachers before they kill an elephant,” said Ko Sai Zaw Oo, an official of a local elephant conservation group in Ngapudaw Township. Police have opened a case against the two poachers. Last year, 13 wild elephants were killed in Pathein, Ngapudaw and Thabaung, and Irrawaddy Region remains the main elephant poaching ground in Myanmar. In February, the European Union urged the Myanmar government to strengthen efforts to protect its wild elephant population, warning that it is on the brink of extinction due to poaching to supply the illegal trade of ivory and skins. EU ambassadors also urged the Myanmar government to end the open sale of elephant and other illegal wildlife parts in markets in its major cities, at popular tourist sites and along its borders. According to WWF-Myanmar, at least one elephant is killed by hunters in Myanmar every week. Elephant skin, hair, teeth and ivory are sold at tourist sites such as the Golden Rock (Kyaiktiyo Pagoda in Bago Region), while ivory is sold in Yangon and Mandalay. Large markets also operate in the ‘Golden Triangle’ border area Myanmar shares with China, Laos and Thailand. According to the Ministry of Natural Resources and Environmental Conservation, 18 wild elephants were poached in 2016, and 30 were killed last year. The current population is estimated at just 1,400-2,000, compared to 10,000 in 1997.